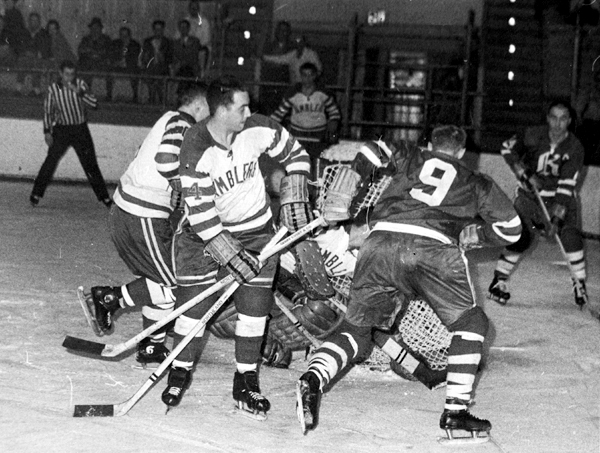 The Clinton Comets' Jerry Frizzelle (9) shoots on the Washington Lions goaltender. 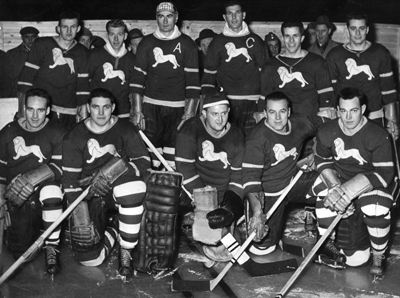 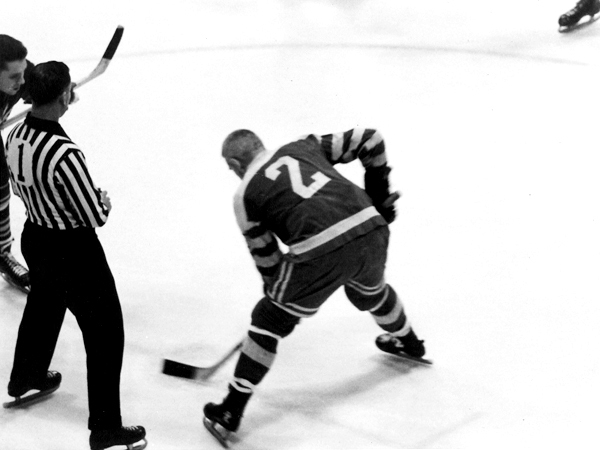 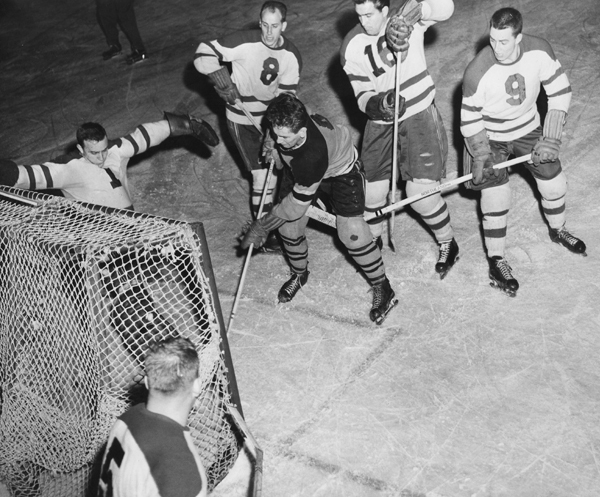 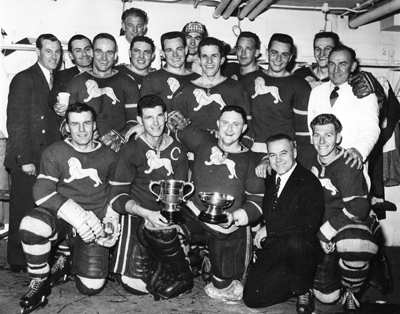 Defending for the Lions are Joe Medynski (2), captain Doug Orvis (3), and player-coach Stan Warecki (8). 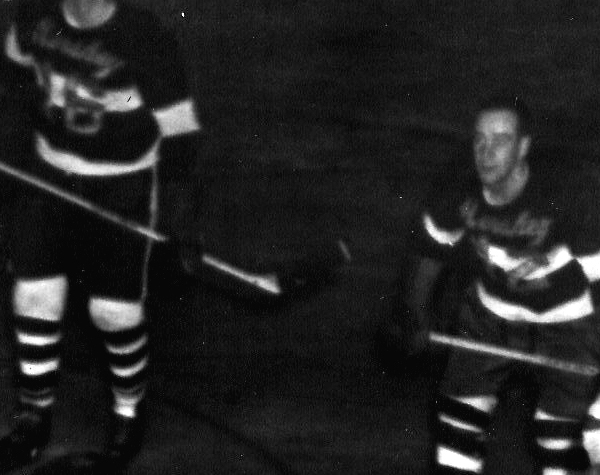 Ralph DeLeo (16), Gerry Sullivan (12), Baltimore Clippers. 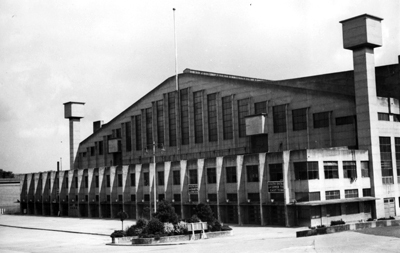 Carlin's Iceland, the Baltimore Clippers' arena, burned down on January 23rd, 1956. 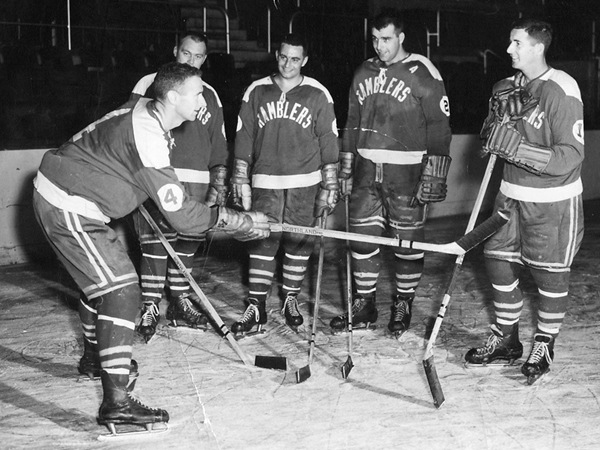 All of the Clippers' equipment was lost. 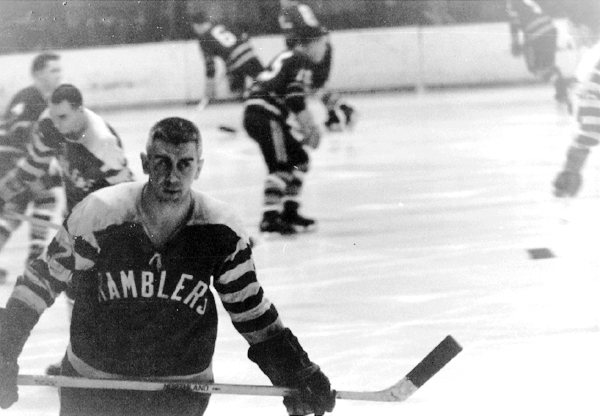 They wore Hershey Bears' uniforms the remainder of the season. 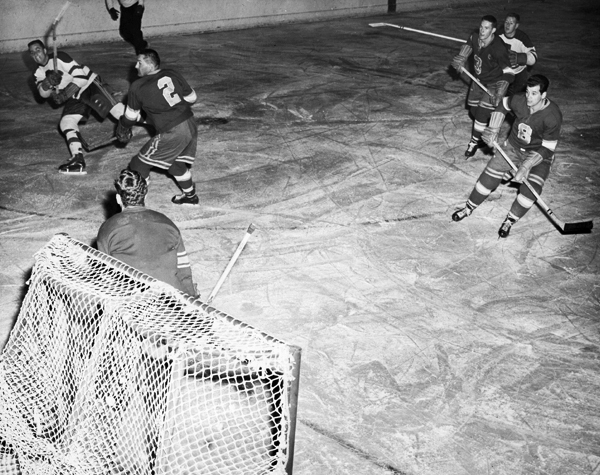 Five of their remaining home games were moved to the new Charlotte Coliseum. 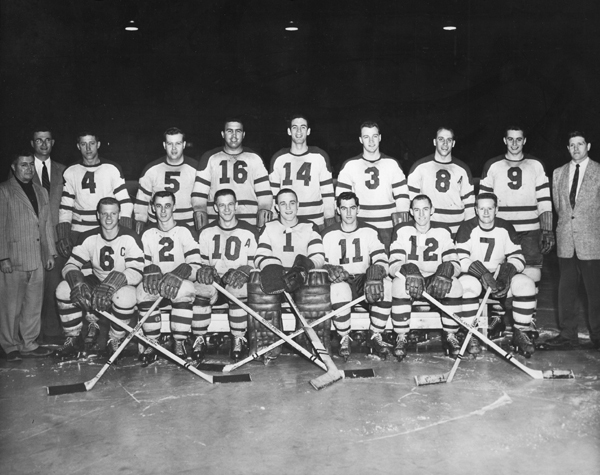 The following season the team became the Charlotte Clippers and won the EHL championship. 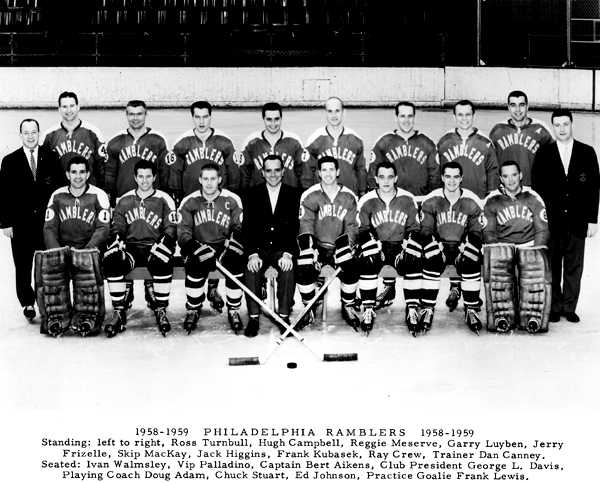 On March 3, 1956, the Baltimore Clippers reduced to an 8-man travelling squad played a "home" game at Clinton, losing 13-9. 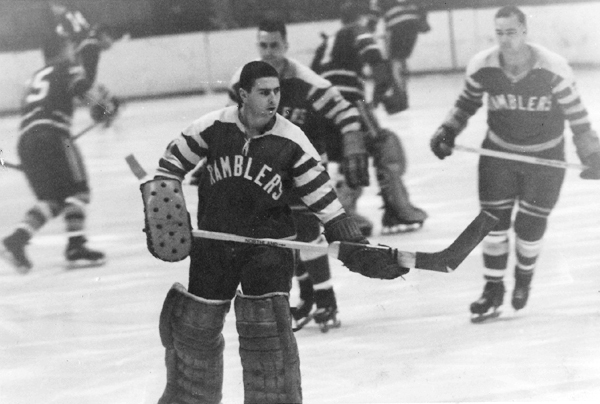 Les Binkley made a team record 57 saves for the Clippers. 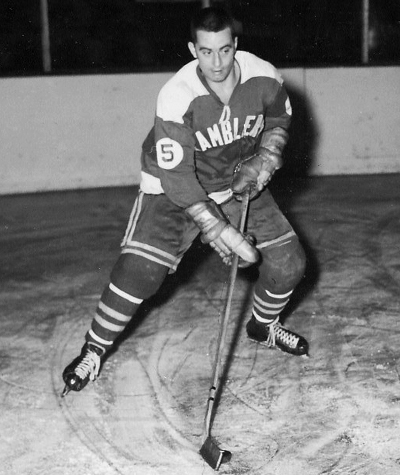 Bibber O'Hearn had 5 goals, including a hat-trick within 5 minutes, and 2 assists for Baltimore. 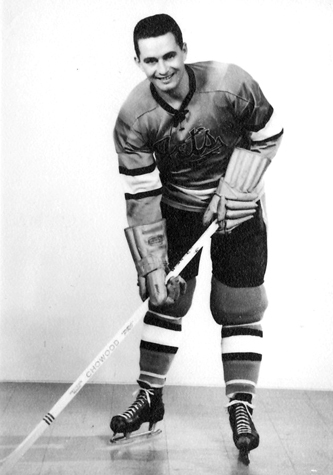 Willie Pawchuk had a hat trick for Clinton. 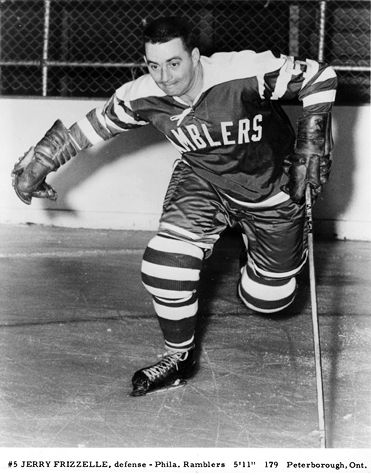 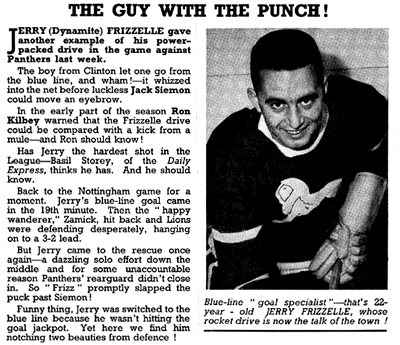 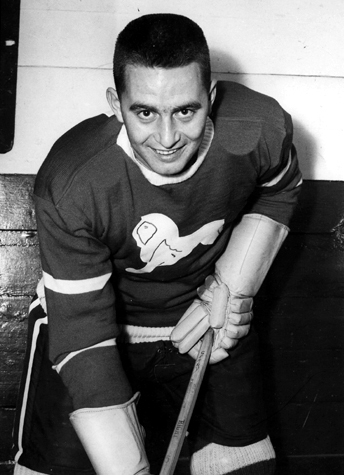 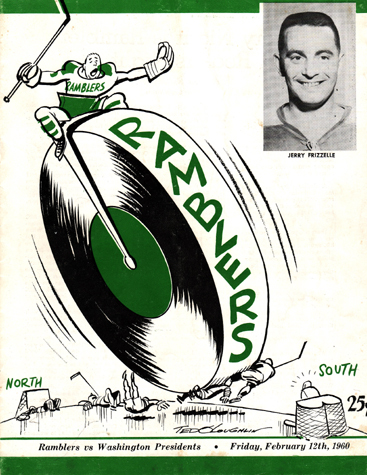 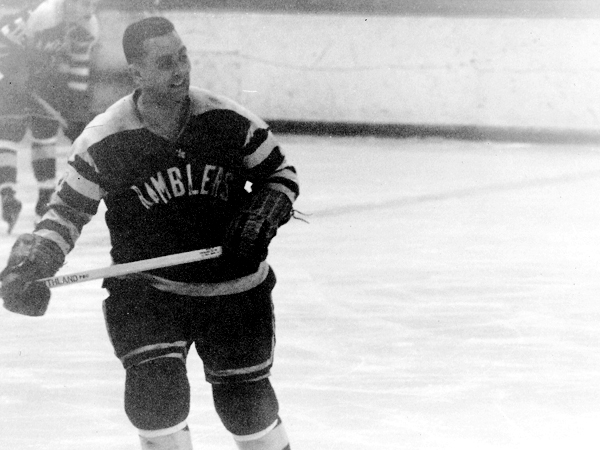 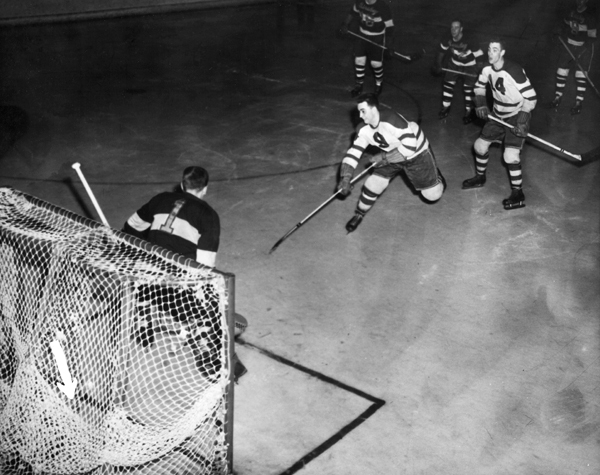 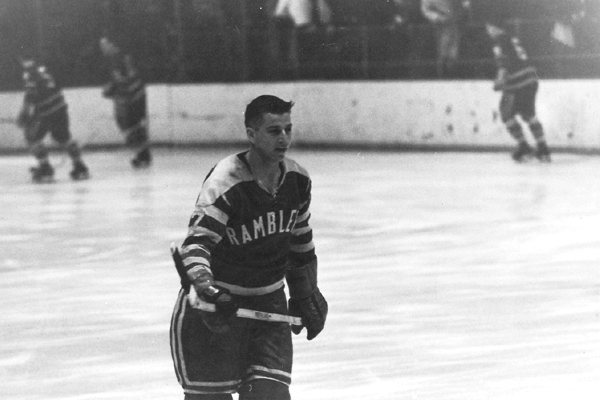 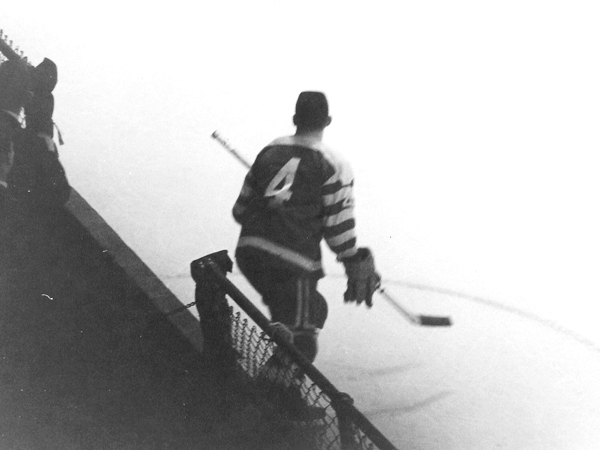 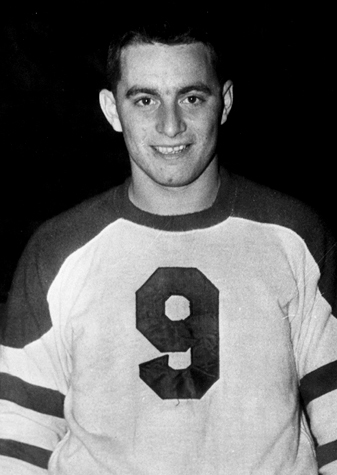 The following day, the Comets won at home vs. the Clippers 11-0, with Jerry Frizzelle scoring four goals. 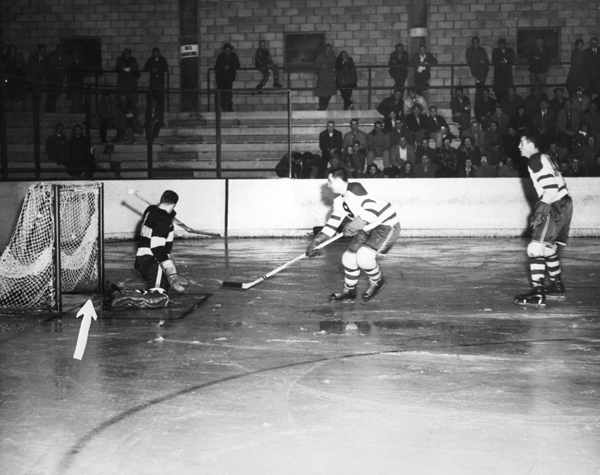 This was Doug Coxon's 4th shutout of the season for the Comets. 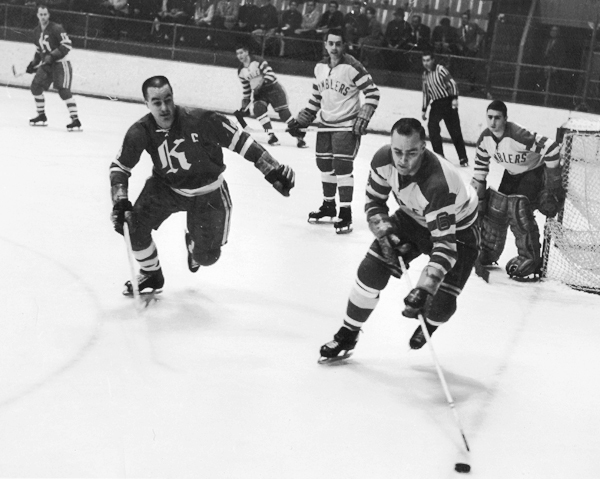 Clinton Comets' Jerry Frizzelle (9) scores on Baltimore Clippers Les Binkley (1) at Clinton Arena in 1956, above and left. 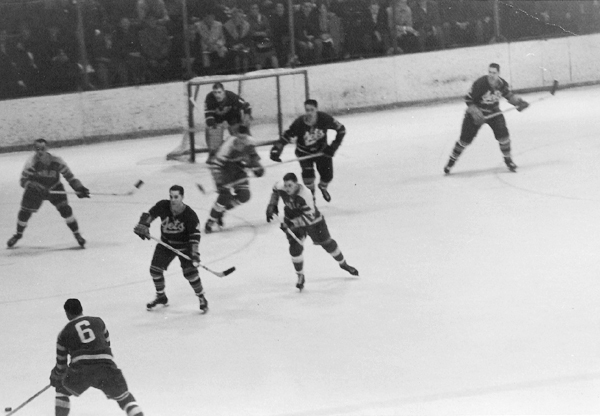 These shots are most likely from the March 4th and 10th games in 1956. 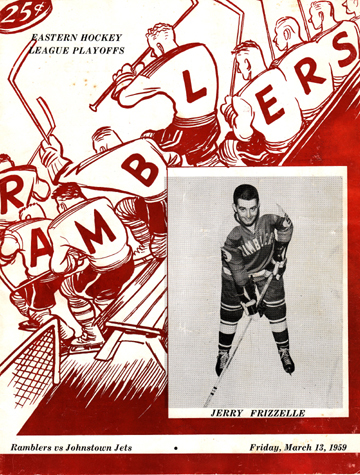 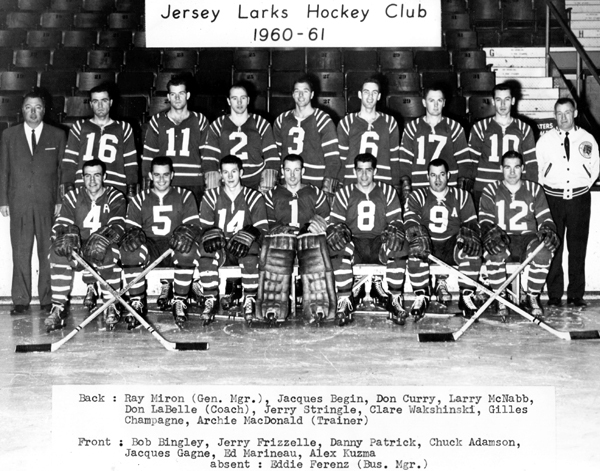 In the latter Jerry Frizzelle scored a goal and Les Binkley had 48 saves (to Doug Coxon's 18), as the Clippers won 6-4. 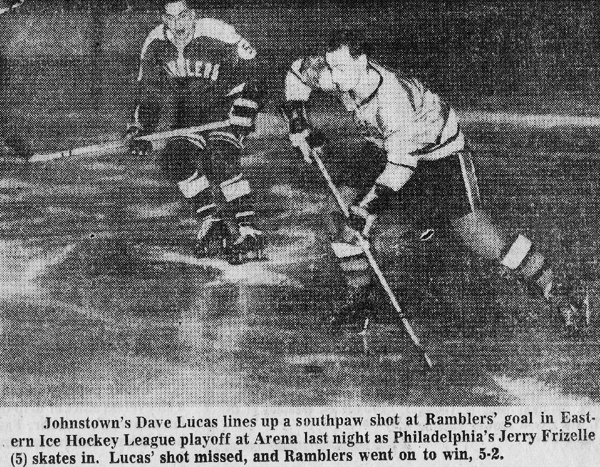 The Comets had already clinched 2nd place, but the win allowed the Clippers to pass the Philadelphia Ramblers and clnch 5th place. 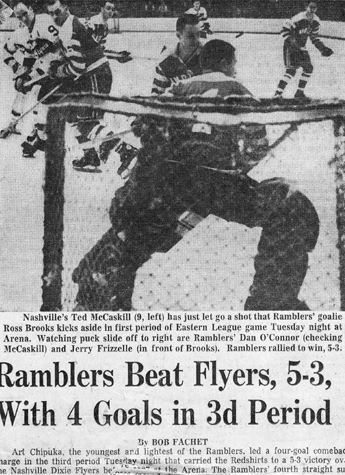 Ted McCaskill (9) Nashville Dixie Flyers Vs. Danny O'Connor, Jerry Frizzelle and Ross Brooks, Philadelphia Ramblers 1962-63.